Classics Talks is delighted to announce a preview of the content of a soon-to-be-published book. 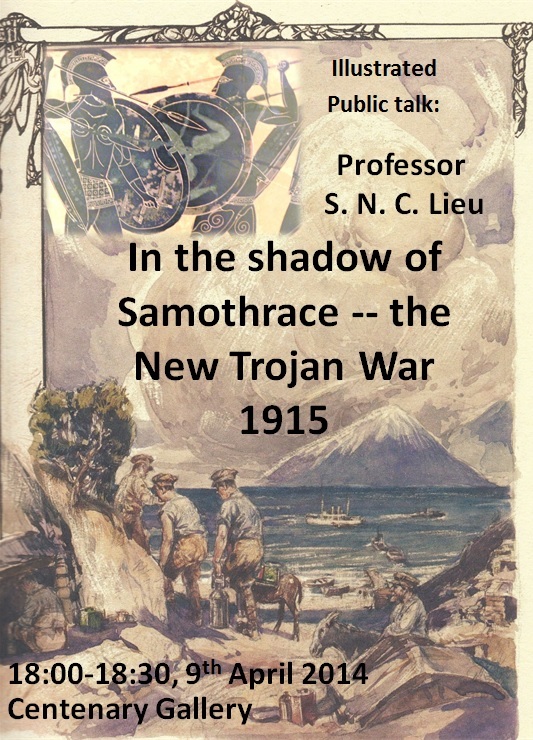 Professor Samuel N. C. Lieu (Inaugural Distinguished Professor of Ancient History, Macquarie University, Sydney, Fellow of the Australian Academy (Humanities), currently Visiting Fellow at Wolfson College, Cambridge) kindly agreed to record his public lecture on Australians’ use of classics to understand events and experiences in WWI from the international conference Classics and Classicists in WWI. The battle landscapes of Gallipoli and the Dardanelles campaign in WWI overlay those of ancient Troy, as memorialised in Homer’s Iliad. Prof. Lieu shows how soldiers reflected on those mythological resonances and how classical themes were absorbed into the memorials of ANZAC (Gallipoli) Day as a new Australian myth of foundation and identity. Professor Lieu’s slides are not available due to copyright restrictions.